The image of Titan on the right, reduced in resolution to show here, was taken by Cassini less than a week ago, on June 9, as it continues its last orbits of Saturn prior to crashing into the gas giant’s atmosphere in September. NASA’s Cassini spacecraft sees bright methane clouds drifting in the summer skies of Saturn’s moon Titan, along with dark hydrocarbon lakes and seas clustered around the north pole. Compared to earlier in Cassini’s mission, most of the surface in the moon’s northern high latitudes is now illuminated by the sun. …Summer solstice in the Saturn system occurred on May 24, 2017. When Cassini arrived more than a decade ago, it was winter on Titan’s northern hemisphere, and the atmosphere was thick with haze. Now the sky is clearing as the stormy weather shifts to the winter in the southern hemisphere. 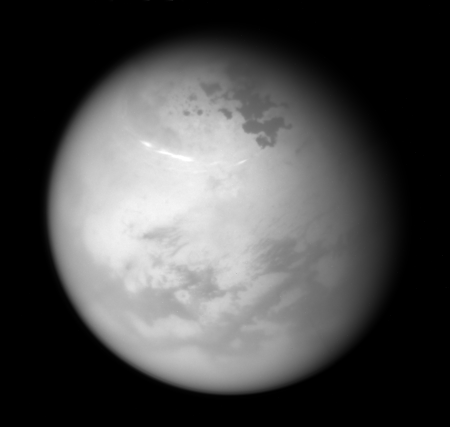 As with yesterday’s global map of Mimas, this image is in many ways a farewell look at Titan. 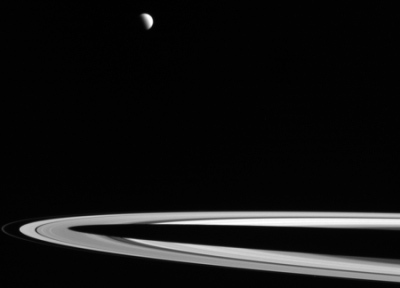 While Cassini will likely get a few more global images of the Saturn moon before the mission ends in September, this image essentially marks the end of our ability to observe this strange planet closely, for decades to come. When Cassini crashes into Saturn, our vision at Saturn will go blind. And no one knows when our sight there will return, as no mission is presently in the works, or is even being considered, to return to Saturn. 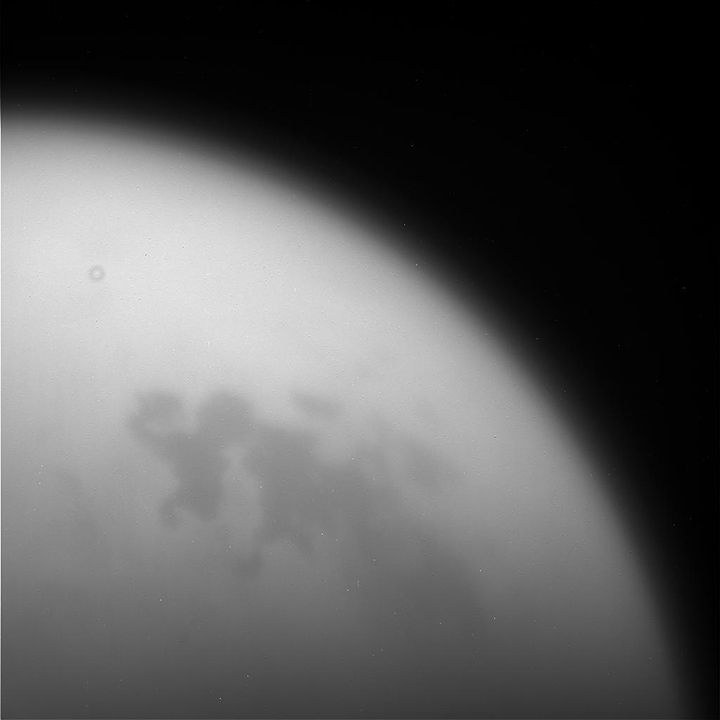 Cassini on April 21 made its last fly-by of Titan as the spacecraft is prepared for its final 22 orbits of Saturn. The flyby zipped past Titan only a little more than 600 miles above its surface. New research suggests that the hydrocarbon lakes of Titan might periodically fizz with nitrogen bubbles. These results might help explain the mysterious islands that seem to appear and disappear and then reappear in Titan’s lakes. Rather than islands, they might be patches of nitrogen bubbles. Since entering Saturn orbit in 2004, Cassini has seen the seasons on Titan shift through half a Saturn year. As Titan approaches its northern summer solstice, NASA’s Cassini spacecraft has revealed dramatic seasonal changes in the atmospheric temperature and composition of Saturn’s largest moon. Winter is taking a grip on the southern hemisphere and a strong vortex, enriched in trace gases, has developed in the upper atmosphere over the south pole. 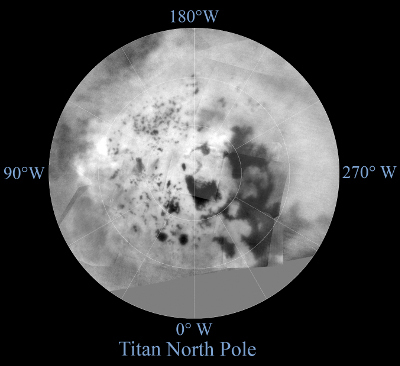 These observations show a polar reversal in Titan’s atmosphere since Cassini arrived at Saturn in 2004, when similar features were seen in the northern hemisphere. Sadly, there will not be any spacecraft at Saturn during the second half of this Saturn year. After Cassini ends its mission in 2017 it will likely be many decades before another spacecraft arrives, since at this moment none has even been proposed. New radar images of Titan taken by Cassini during its July 25 fly-by of Saturn’s moon have revealed long linear dunes. Cool image time! New data from Cassini has now both confirmed that there is liquid inside some of the river-like formations on Titan, and that this liquid has carved these formations into very deep gorges. The Cassini observations reveal that the channels — in particular, a network of them named Vid Flumina — are narrow canyons, generally less than half a mile (a bit less than a kilometer) wide, with slopes steeper than 40 degrees. The canyons also are quite deep — those measured are 790 to 1,870 feet (240 to 570 meters) from top to bottom. 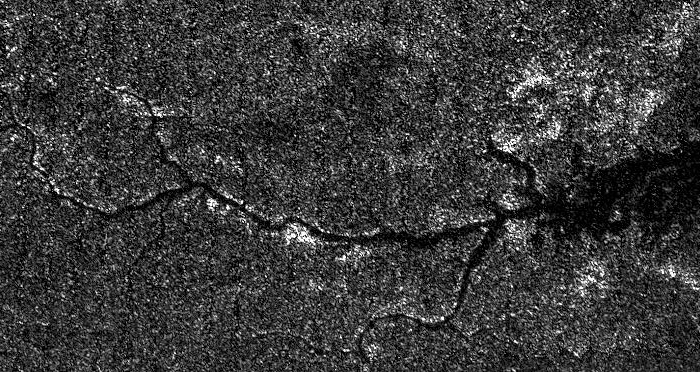 The branching channels appear dark in radar images, much like Titan’s methane-rich seas. This suggested to scientists that the channels might also be filled with liquid, but a direct detection had not been made until now. Previously it wasn’t clear if the dark material was liquid or merely saturated sediment — which at Titan’s frigid temperatures would be made of ice, not rock. The diagram on the above right is from the paper itself, and shows some of the radar data obtained by Cassini. It also illustrates the deep and narrow nature of Via Flumina. This is almost the equivalent of what we call slot canyons on Earth, formed by periodic flash floods that cut their way down as the surface is slowly uplifted by other processes. The new radar data showed that the surface at the base of the gorge was smooth and flat, just as you’d find if that base was filled with liquid.The altimeter data showed that gorge’s elevation matched that of Titan’s lakes at its insurgence, but as you traveled upstream the elevation rose, just as it does on any river on Earth. Moreover, this data was reasonably trustworthy as they had already used Cassini to successfully do exactly the same thing — identify a known river — when it flew past Earth on its way to Saturn. Be prepared for one piece of misinformation when the press reports on this story, almost certainly caused by the American Geological Union’s press release about this paper. That press release incorrectly claims that the paper confirmed that these are methane rivers. It does no such thing. It only shows that the gorges have a liquid in them, and that the liquid almost certainly formed the gorges. Though methane is a very likely candidate for this liquid based on what we know of Titan, the actual make-up of the river remains uncertain. I therefore predict our incompetent modern mainstream press will only read this press release and not the paper itself, and thus they will tout these incorrectly as methane rivers. 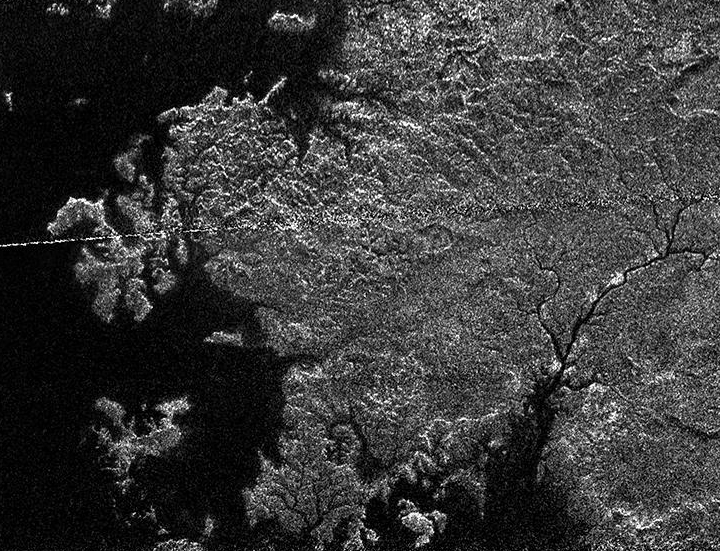 Below is a cropped Cassini radar image of Via Flumina, showing its river-like appearance. Scientists always suspected these were formed by flowing liquid. Now they have strong evidence from within the gorge to justify that suspicion. Cool image time! The picture on the right, taken on January 26, 2016 by Cassini and reduced and cropped to show here, captures Titan above Saturn’s rings, which are themselves partly obscured by the shadow of Saturn (unseen on the right) that falls across them. Make sure you go to look at the full image. This is the kind of vista that artists in the 1950s imagined we’d see once we began to explore the solar system. We await the data! Yesterday Cassini did its 118th flyby of Titan, getting close enough for two of its instruments to directly measure the planet’s upper atmosphere. After more than a hundred flybys by Cassini of Titan scientists think they have located most of Titan’s mountains, including what they think will be its highest peak. Cool image time! 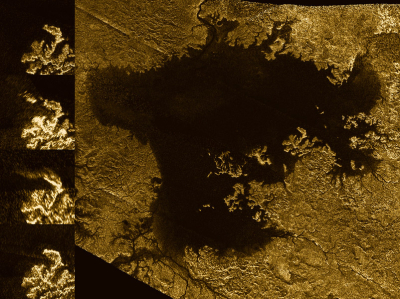 Using radar images taken during the past decade by Cassini scientists have discovered changes taking place along the shorelines of Titan’s hydrocarbon seas. Analysis by Cassini scientists indicates that the bright features, informally known as the “magic island,” are a phenomenon that changes over time. They conclude that the brightening is due to either waves, solids at or beneath the surface or bubbles, with waves thought to be the most likely explanation. They think tides, sea level and seafloor changes are unlikely to be responsible for the brightening. The images in the column at left show the same region of Ligeia Mare as seen by Cassini’s radar during flybys in (from top to bottom) 2007, 2013, 2014 and 2015. These shoreline changes are not the only ones spotted by Cassini. However, because these are radar images, not visual, there are many uncertainties about what causes the changes, which is why they list several possibilities. For example, with radar, a simple roughness on the surface (such as waves) could cause a brightening. The Cassini science team has released new maps of Titan, including new maps of both poles, assembled from images taken during the 100 flybys that the spacecraft has made of the moon since it arrived in orbit around Saturn. The scale is rough, just less than a mile at best, and there is no topographic information because the thick atmosphere allows for no strong sunlight or shadows. The images show differences in surface brightness, which does tell us where Titan’s dark methane lakes are. This is likely the best we will get of Titan for decades, until another spacecraft is sent there. …watch a video of its descent. The video is posted below the fold. This anniversary also celebrates the tenth anniversary of Cassini orbiting Saturn. Thar’s black gold up thar! Data from Cassini has confirmed the presence of ocean waves on Titan’s seas, while also providing suggesting that they are made mostly of liquid methane, not ethane as had been predicted. 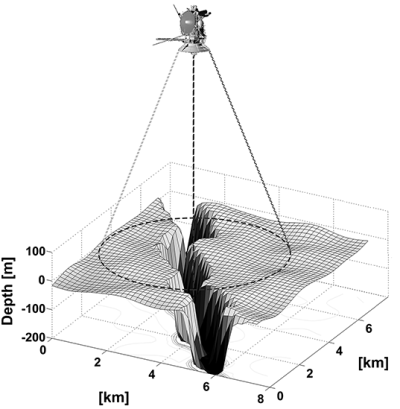 The maximum depth of Kraken Mare appears to be 160 meters, and Ligeia Mare could be as much as 200 meters deep, reported Marco Mastrogiuseppe of Sapienza University of Rome. The fact that the radar signals could bounce off the sea bottom suggests that the seas were more transparent than expected and thus must contain mostly methane, not ethane. Hayes says his best estimate is about 90% methane. Essam Marouf, a planetary scientist at San José State University in California, reported on the first results from a separate radar experiment that sent radar reflections to Earth instead of back to the spacecraft. Those tests provide independent evidence that the seas are dominated by methane, Marouf says, and it implies that the lakes are kept filled by precipitating methane. The uncertainty of science: New data from the ground-based telescope ALMA suggest that certain organic molecules in Titan’s atmosphere are not evenly distributed through the atmosphere as expected. At the highest altitudes, the pockets of organic molecules were shifted away from the poles. These off-pole concentrations are unexpected because the fast-moving, east-west winds in Titan’s middle atmosphere should thoroughly mix the molecules formed there. The researchers do not have an obvious explanation for these findings yet. I would not take these results too seriously, as the data are very sketchy. With better data many of these questions will vanish, replaced by new questions that are better based on reality. Data from Cassini has found that the onset of winter in Titan’s southern hemisphere is coming on faster and colder than expected, with toxic clouds to boot. The toxic cloud at the south pole is made up of hydrogen cyanide, and it could only form if the temperature there was colder than expected. 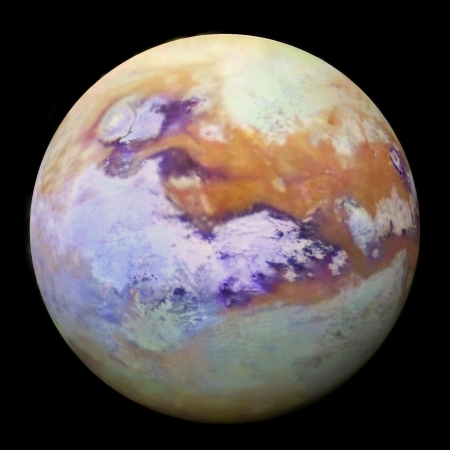 New Cassini images of Titan have spotted the appearance of clouds above the planet’s northern seas, suggesting the overdue onset of the summer storms that climate models have predicted. Any conclusions drawn at this time about the seasonal weather patterns of Titan must be considered highly uncertain, since we only have been observing the planet for a period that only covers one very short portion of its very long 30 year-long year. Radar images of Titan taken in 2013 by Cassini show a twelve-mile patch appear in one of the moon’s methane lakes, then disappear. The mysteries of science: Radar images of Titan taken in 2013 by Cassini show a twelve-mile patch appear in one of the moon’s methane lakes, then disappear. They really don’t know what this patch is. Prior to the July 2013 observation, that region of Ligeia Mare had been completely devoid of features, including waves. Titan’s seasons change on a longer time scale than Earth’s. The moon’s northern hemisphere is transitioning from spring to summer. The astronomers think the strange feature may result from changing seasons. It is very important to remember that Titan is a very alien planet to the Earth. While some features, its methane lakes, have a superficial resemblance to lakes on Earth, the materials and environment are completely different. For example, on Earth the only thing that generally floats on water is ice, so that when winter arrives the surface freezes while the water below remains liquid. On Titan, if the methane freezes the ice will sink.